A workhouse was erected in Atherstone in 1723. It stood at the south end of Long Street on the site of the present Grammar School. In 1737, the Atherstone Vestry meetings appointed twelve "Governors of the Poor" to manage a poorhouse. In 1738, Peter Davis from Wolverhampton was appointed as Master of the Workhouse which was extended in the same year. In the 1770s, the workhouse could accommodate up to sixty inmates. In the early 1800s, the inmates were employed in manufacturing cotton and in 1819, Henry Baker was employed to "undertake the management of the Cotton factory and Poor House." County of Warwick: Ansley, Atherstone (4), Baddesley Ensor, Baxterley, Bentley, Grendon, Mancetter or Mancester, Merivale [Merevale], Oldbury, Polesworth (2). County of Leicester: Allerton, Fenny Drayton, Sheepy Magna, Sheepy Parva. The population falling within the Union at the 1831 census had been 9,489 with parishes ranging in size from Oldbury (population 80) to Atherstone itself (3,870). The average annual poor-rate expenditure for the period 1833-35 had been £5,332 or 11s.3d. per head of the population. The Atherstone Union workhouse stood at a site acquired in 1836 on Long Street in Atherstone. The workhouse appears to have been an adaptation of an existing building as the Poor Law Commissioners authorised an expenditure of £2,500 for it be "altered and enlarged". 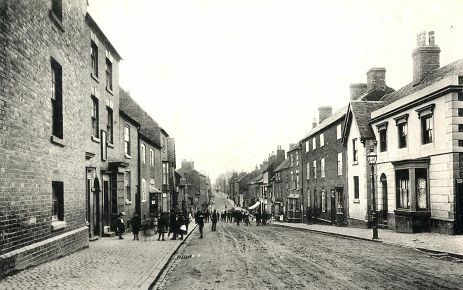 Atherstone Long Street from the east (workhouse at left). A new hospital was opened at the south of the workhouse in 1911. This was extended in 1914 when a new kitchen and Master's residence were also erected. 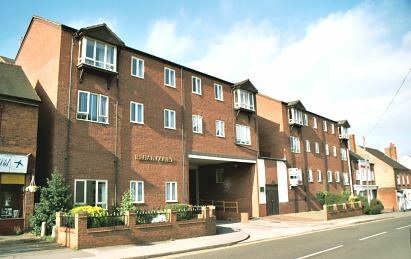 Modern flats now occupy the former workhouse site. Atherstone former workhouse site from the east, 2001. Warwickshire County Record Office, Priory Park, Cape Road, Warwick CV34 4JS. Holdings: Guardians' minute books (1863-1930); Accounts (1855-1930). The History of Atherstone by Brenda Watts and Eleanor Winyard (1988).